A wedding is a special moment shared between the bride and groom, but also with the bridal party. When it came time to asking my maid of honour and bridesmaids to be a part of my big day, I knew that I wanted to do something special for them. They’ve been a part of every milestone leading up to this moment and I wanted them to be there at my side as I walk down the aisle. I wanted to surprise them with a thoughtful, curated gift box filled with little sentiments from a few brands that I love. Something Old, Something New, Something Borrowed, Something Blue. Or Something Gold. 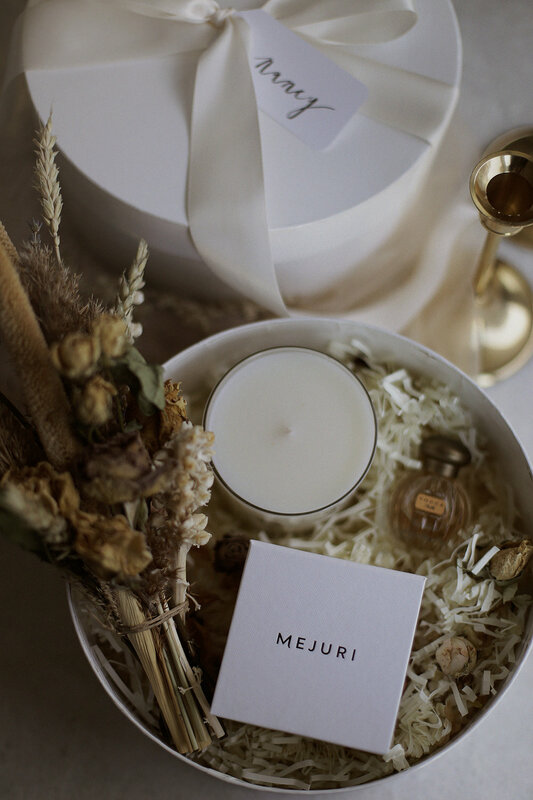 You can never go wrong with a gold and dainty piece by Mejuri. All of their pieces are hand-crafted with precious metals, gemstones and diamonds so you know that they’re delivering the finest quality. For my bridesmaids, I went with a delicate lotus necklace and for my maid of honour, I selected something a bit more personalized with a bracelet that was engraved with the letter 'T'. These pieces are perfect keepsakes and are great for everyday wear. If you're in Toronto, their showroom is now open at 906 Dundas St W. so you can go in to touch and try on the many pieces! I discovered this brand while I was in New York and fell in love with the simplicity. The Cassis scent is my absolute favourite and exudes a fruity note with an aromatic white rose and warm oakmoss base. I'm a believer that candles can warm both your heart and home so I love gifting them for special occasions. These dainty Tocca fragrances are captured in charming little vintage-styled vials that make them great for the vanity, but also to take on-the-go. The brand is named after the Italian word for ‘touch’—their scents evoke an Old World romance mixed with the unexpected, fresh and new. Out of all the scents, my favourites are Stella and Liliana. This was the perfect way to add a nice Italian touch because we got engaged under the Faraglioni in Capri and will be getting married in Italy! No gift is complete without some kind of floral arrangement. The lovely team at Wild North Flowers brought my vision to life with these picture-perfect bundles in a muted blush and neutral palette. Something that would last longer than a few days and can be used as a decorative piece in the home. The bundles came with a sweetheart bud vase so it can be re-used over and over again. With every gift, I believe that there should be something personalized and heartfelt. A handwritten note always accompanies any gift that I give because there's something so special about them. They don't have look beautiful or be anything fancy, but just the mere idea of sharing your thoughts on a piece of paper meant just for the person gives them meaning. It's also something that they can hold onto forever. For each one of my bridesmaids, I wrote a sentimental card and sealed it with love in a bespoke Artisaire wax seal. The beautiful antique gold seal adds a nice finishing touch.